It has been a busy few weeks for us around the garden. Lots of clean up, harvest and Autumn planting. AND we have a bit to go until all is put to bed for the Winter. We expanded our garlic planting this Fall and should have a bounty next year for the boxes. Over 1200 cloves went in on a balmy day a few weeks back. We planted long rows of Spinach to winter over, and created a wonderful herb area too. The new hoop house is planted with Winter lettuce and spinach and hopefully a few other Spring Crops will get in before it is too cold. Our new leaf mulch/compost pile grows whenever Scott has a moment to haul a few loads from the mountain of leaves the city drops off in the front yard for us. Our evenings are spent planning out the crops and the new planting rotation in the garden for next year. Our Winter Storage Box is HUGE!! 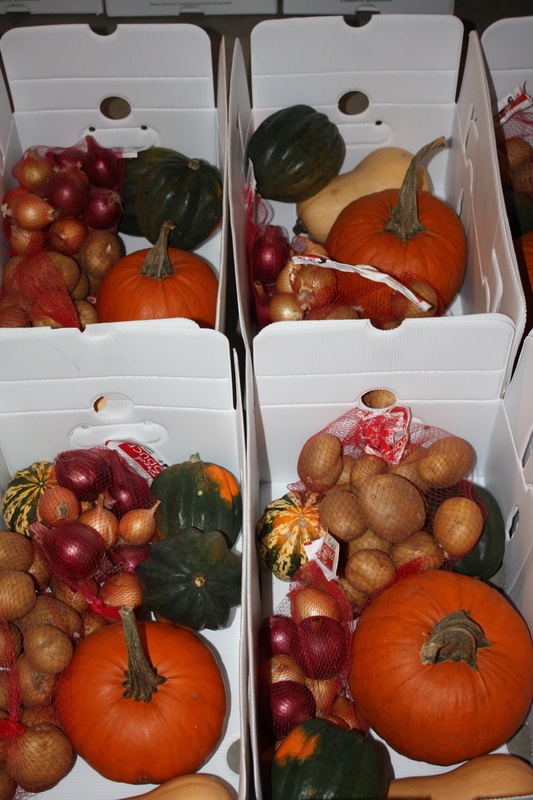 We are so pleased with the quality and the quantity of the harvest. Enjoy the Share for weeks to come. 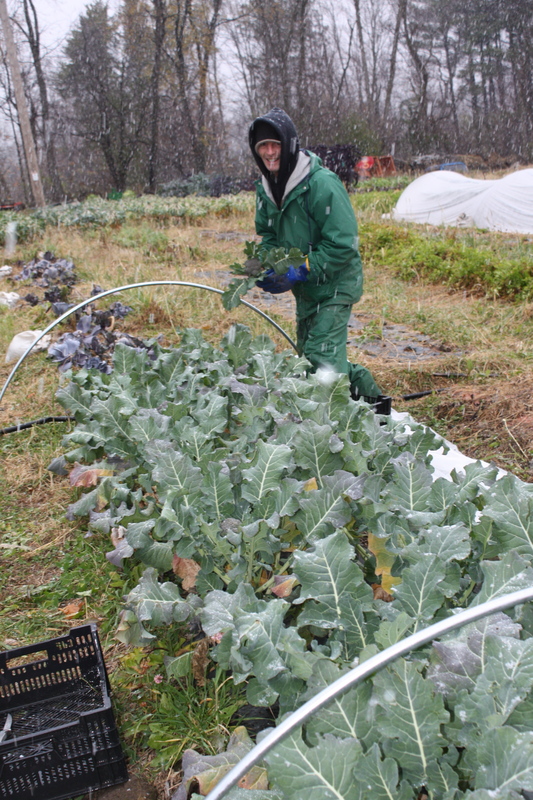 Scott harvesting the cold hardy Broccoli in the snow. Beautiful Broccoli. A variety called Arcadia. 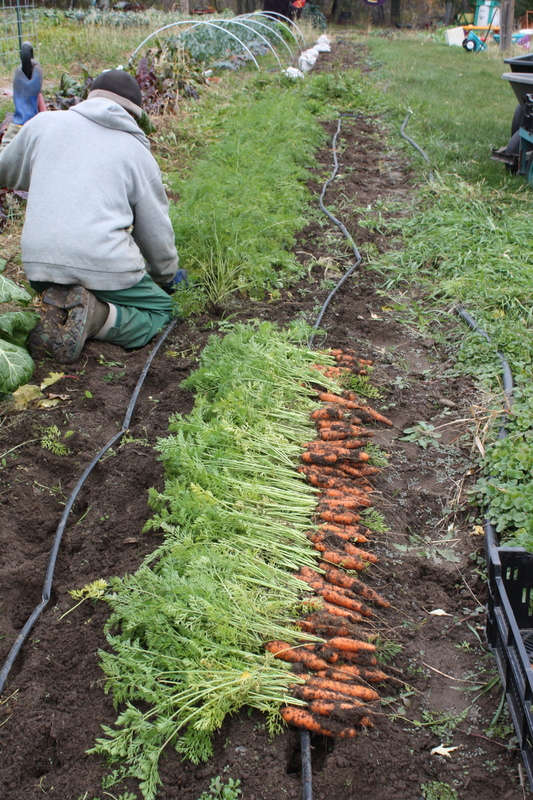 As I have mentioned in the past one of our biggest goals this year was to have a huge carrot crop. 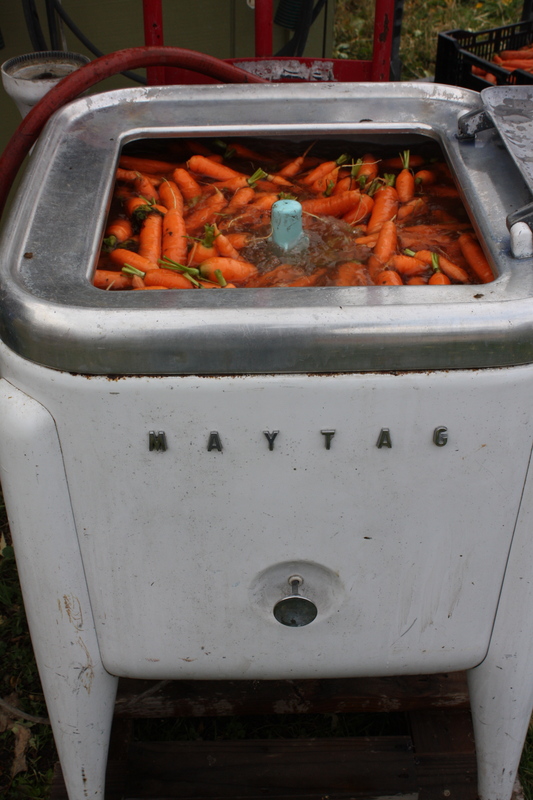 We were successful with the Summer offering and able to provide carrots many times during the season. 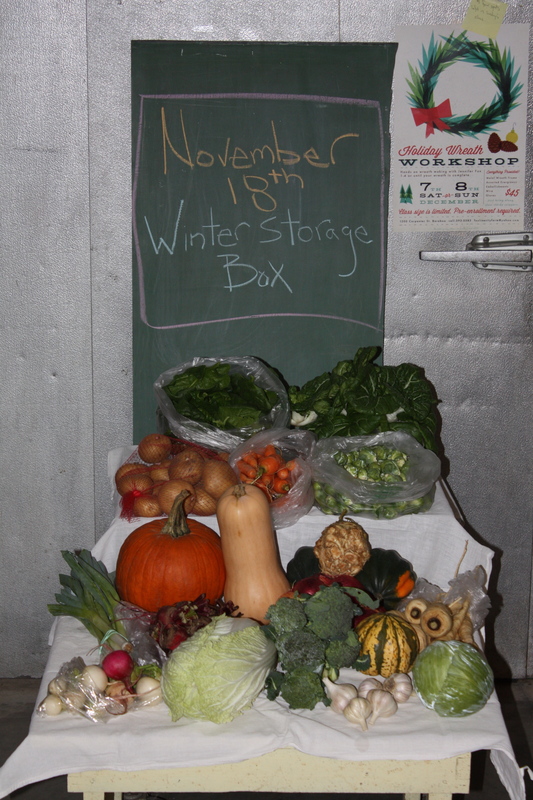 We are thrilled with our Winter Box harvest too. Beautiful and Sweet Carrots. We let the frost touch them and they are delicious. Maeve chomps them down every chance she gets and the other day she said “these are better than candy!” Roasted they are amazing, raw a perfect treat, added to soups and even steamed they are the star of any meal. 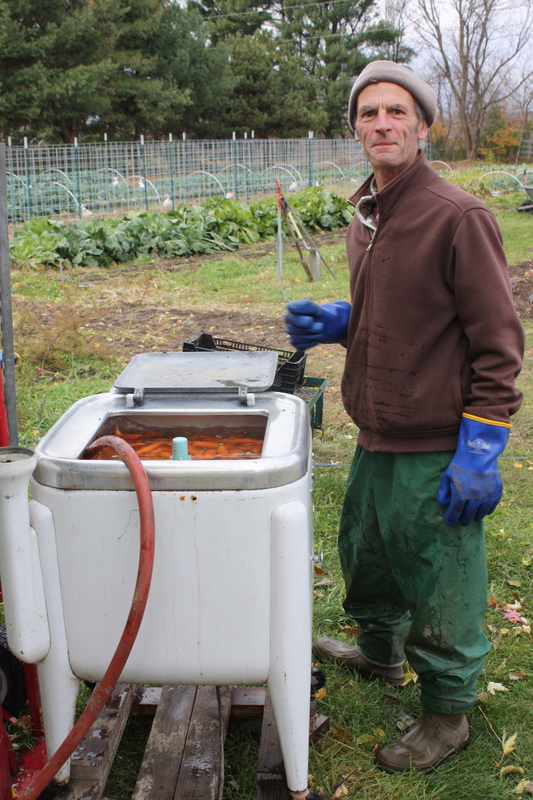 Scott starting the carrot harvest. First rinse in the Maytag washer. 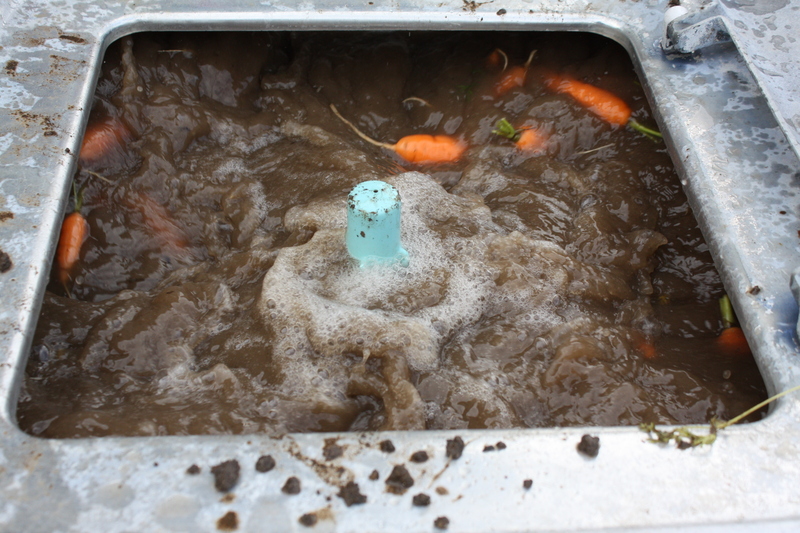 Scott washing the carrots in the cold. Tons of Brussels Sprouts are out on the stalks and the plants are loaded. 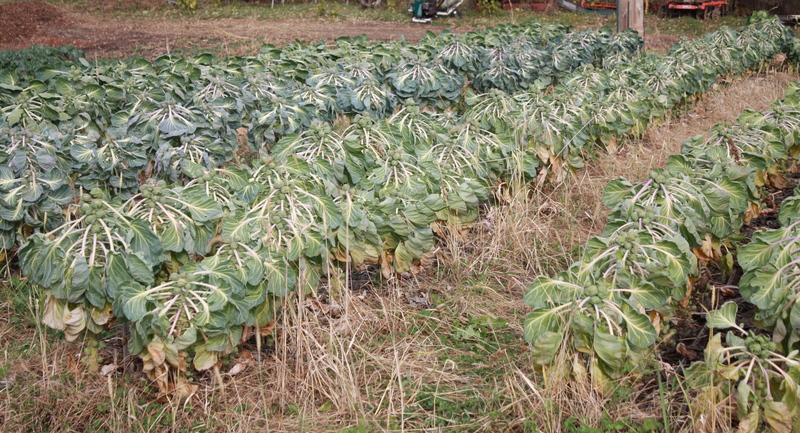 This is a crop that is difficult to harvest when it is too cold. It is rough to snap the little gems from the stalks with frozen fingers. We planted 3 different varieties one of which is extremely cold hardy. A nice sized bag is in each box this week and more to come in the second box. The brussels sprouts in the garden. We cut the tops of the plants a few weeks back to promote sprout development. Get ready for this! It’s a double box day. We packed all the non refrigerator items in a separate box……weight this week is just over 41 pounds. WOW! Parsnips-Will hold for weeks in a zip lock in the crisper drawer on the refrigerator. Wonderful pan fried, roasted in a root crop medley or added to soups and stews. A favorite winter flavor in our house. Cabbage-the small Gonzales variety we are so fond of. Chinese Cabbage-Delicious juicy heads. These too will store for months in a zip lock in the fridge. Makes a wonderful fresh slaw or tasty in stir fries or added to broth. Broccoli-Finally!! A bountiful broccoli harvest. 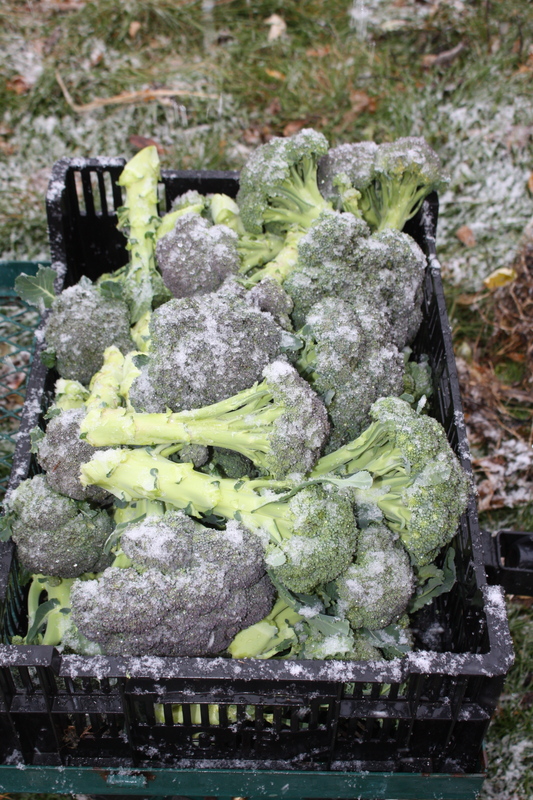 We struggled with our broccoli this year and are happy to have an abundant harvest. Very flavorful and sweet. Beets-A rich robust selection. We left these in the ground to get a few frosts in order to convert the sugars. Turnip/Radish Assortment-A mix bag of 4 different varieties. Carrots-2 varieties-Yaya and Nelson. SWEET! Storage Onions-A 2 pound mix. Squash-A collection of acorn, carnival, and butternut. Pie Pumpkin-For Thanksgiving of course. Garlic-A collection of Music and German Red. 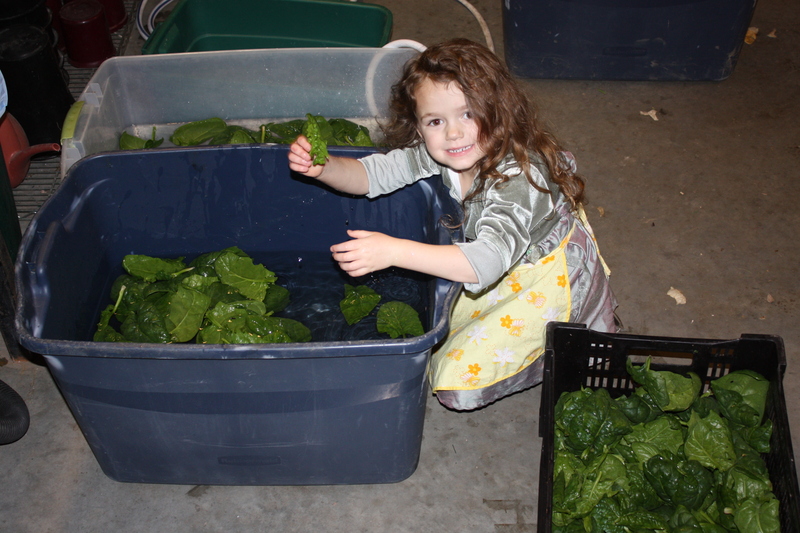 Spinach-A juicy harvest from the new hoop house. 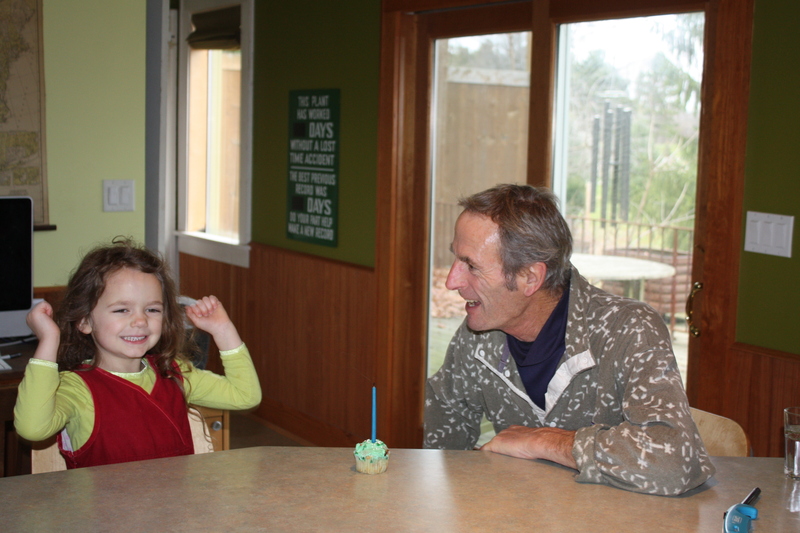 Maeve helped do the rinsing. Brussels Sprouts-My all time favorite Fall crop. Enjoy. Leeks-2 variety of cold hardy leeks. A favorite in potato leek soup. Pac Choi-Mini heads harvest from the hoop house. Celeriac Root-Delicious added to soups and stews and wonderful raw in salads. Holds all winter in the crisper in the fridge. Have a wonderful Thanksgiving! Thanks for sharing the Autumn Garden with us. We are grateful. 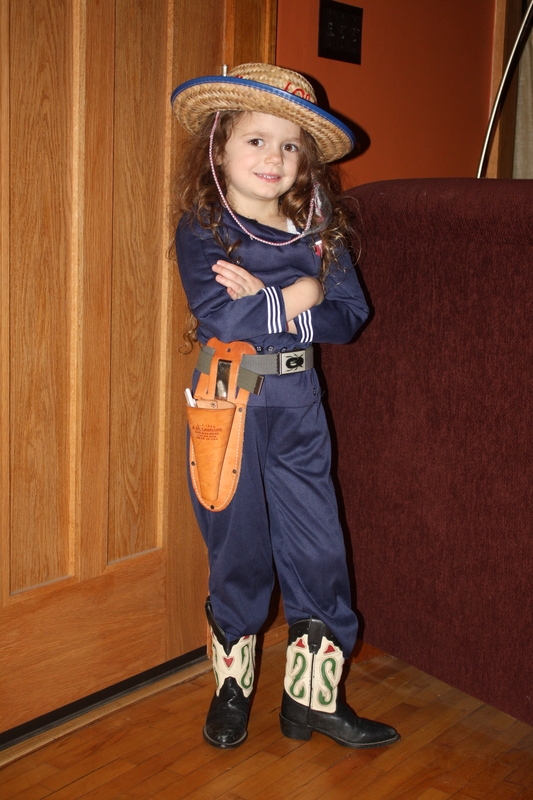 Maeve is on a major Lone Ranger kick……this was our box prep entertainment this week. NEXT STORAGE BOX PICK UP IS DECEMBER 9TH. I am so excited to come get my boxes, it looks awesome! And so cool Maeve rocks the cowboy/ girl boots! I love boots!